At just more than five acres, the $10.6 million exhibit will feature two yards for people to see Stephanie and Cinda and the African elephants that will join them. It also will have two off-exhibit yards sized at 8,395 square feet each, an 18,000-square-foot barn, an almost 3,000-square-foot viewing area called a “gathering place,” a concessions building and a shaded amphitheater with 156 seats. The south yard will be 3.6 acres. The north yard will be 1.2 acres. The zoo’s current outdoor elephant space is roughly 20 percent the size of the north yard. It will be the first exhibit in the world to feature boat rides that will put visitors in the same water as elephants. Zoo director Mark Reed and Gayle Malone, a board member of the Sedgwick County Zoological Society, unveiled plans for the exhibit in a meeting with The Eagle. Reed said only the San Diego Safari Park and North Carolina State Zoo will have bigger elephant exhibits. “Since I became director, I have wanted to do something for Stephanie and Cinda. I’ve wanted them to have buddies. There’s no question for animal welfare that they belong in a social herd group,” Reed said. The Association of Zoos and Aquariums is requiring that its zoos that feature elephants have at least three females, two males or three elephants of mixed gender by September 2016. That’s because the huge animals are social. If Cinda died, Stephanie would suffer and vice versa. 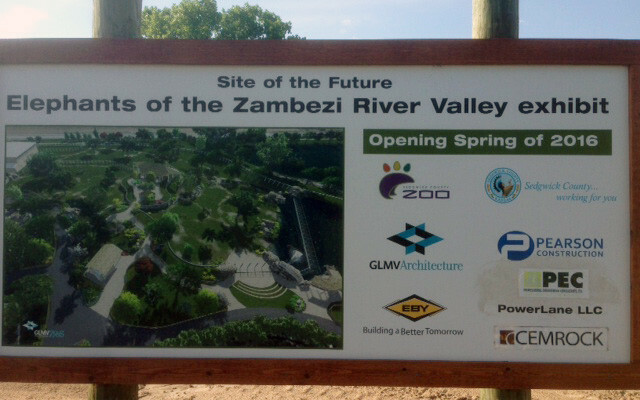 The zoo plans to start moving dirt next month on what is its most expensive project ever. The exhibit is scheduled to open over Memorial Day weekend in 2016. Getting Stephanie and Cinda some friends – the zoo expects to bring in at least four more elephants – is Reed’s No. 1 reason for pushing for a new exhibit. “Guaranteeing for this community that they will have the opportunity to see elephants,” Reed says. Elephants are dying at a rate of 96 a day in the wild, according to www.96elephants.org, because of poaching and loss of habitat. If nothing is done, African elephants will be extinct in 15 years, Reed said. The new elephant exhibit will be situated on what is now empty land between the Downing Gorilla Forest and the Pride of the Plains. Putting visitors in the same water as the elephants is something that has been done with hippos in Europe and in the wild, Reed said. Malone accompanied Reed on a safari and said being that close to elephants – especially babies – is exhilarating. “Watching elephants in the water is really pretty cool,” she said. Reed said the design, by Wichita’s GMLV Zoos, does a great job of immersing people in the exhibit so they can see elephants in every direction. “We want to be on the cutting edge in our profession,” Reed said. The society has raised $4.3 million, including $655,000 from its own board. Sedgwick County commissioners recently voted 3-2 to use $5.3 million of reserves to build the elephant barn, which gives the county naming rights to the building. Two commissioners – Karl Peterjohn and Richard Ranzau – voted against giving the zoo the money, saying that it set a bad precedent and that the county had more important core services to fund. Peterjohn advocated foregoing AZA accreditation. Ranzau said he would support using reserves for the zoo if the county also used reserves to reopen the Judge Riddel Boys Ranch for troubled teens. Money for additional zookeepers already has been factored in with a five-year funding agreement the county approved last year. “I’m hoping that we will have equipment here starting to stake things out the first week in October,” Reed said. Pearson Construction, LLC is doing site and utility work, and Eby Construction will be the general contractor. All steel work and a rotational elephant restraint device, which will allow zookeepers and veterinarians to examine the elephants, is being done by PowerLane LLC. “This whole exhibit had to be made to withstand a full-grown African bull elephant,” Reed said. A male elephant weighs about twice what Stephanie or Cinda weighs. Reed thinks 90 percent of the exhibit will be finished by next September. The zoo does not expect to have any problems getting additional elephants. It will do so through arrangements with other AZA-accredited zoos. It’s not the first time the zoo has built an exhibit for animals not yet in Wichita. “We have done that in the past with the gorillas, tigers and penguins,” Reed said. Reed hopes Wichita will eventually have a breeding herd that will produce baby elephants. Malone said seeing baby elephants in the wild blew her away. The zoo expects to be able to raise more money for wild elephants because of the new exhibit. “You know the good you’re going to do with it,” Malone said.